Do you and your family members hunch over your smartphones, tablets, and other handheld devices for hours on end? Studies suggest that the average person does just this for approximately 5 hours each day. Usually, when using handheld devices, a person sits with his or her head forward, shoulders slumped, and upper back rounded. The result? An epidemic of Text Neck, a repetitive strain injury characterized by neck, shoulder, and upper back pain, and/or chronic headaches. The solution? Your Physiotherapist can help you to relieve your pain and put an end to your suffering. Your Physiotherapist assesses your posture, your movement patterns, and your lifestyle to determine the specific cause of your pain and design a unique treatment plan. He or she works with you to decrease neck and shoulder pain and muscle tension using joint mobilizations, taping, acupuncture, and/or soft tissue massage. To ensure that you achieve proper posture and movement patterns, your Physiotherapist may prescribe appropriate postural, stretching, and stabilization exercises. He or she will also help you make small changes to your postures and lifestyle that will help prevent further episodes of Text Neck. 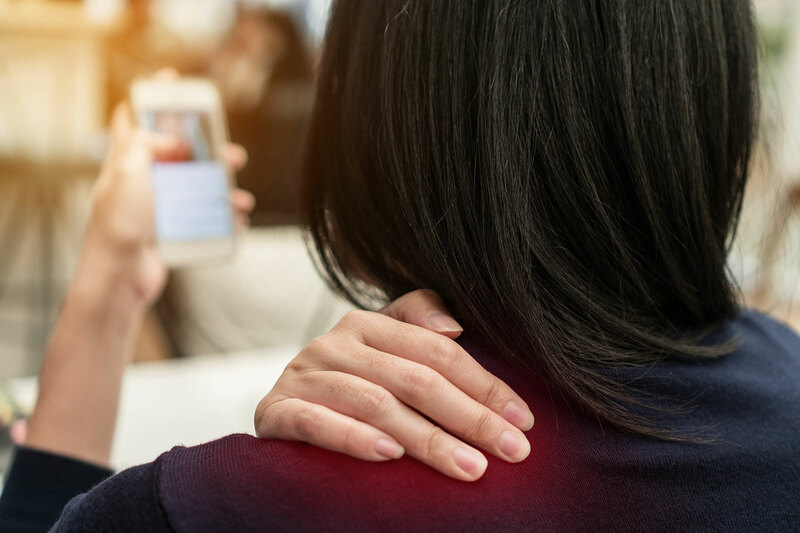 Your Physiotherapists at Keystone Physiotherapy are highly experienced in working with patients to reduce pain, speed recovery, and prevent further episodes of Text Neck. We offer early morning and evening appointments, allowing you to work around busy schedules. Call us today for relief from Text Neck!